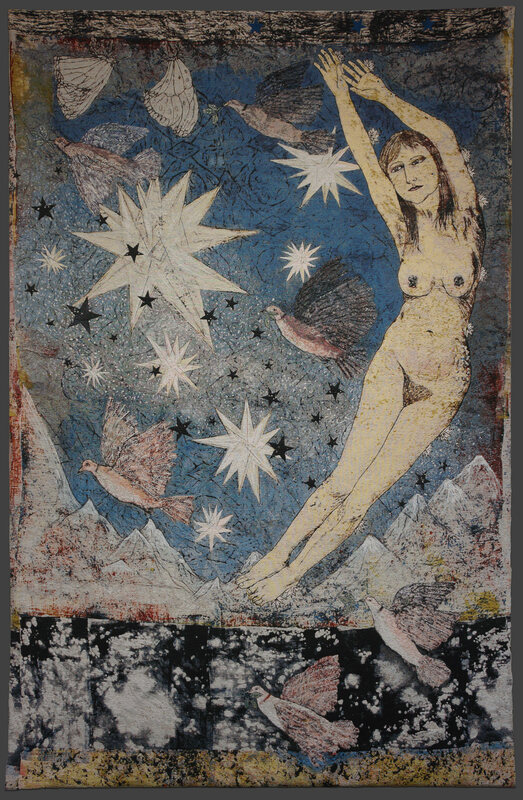 As an artist uniquely attuned to surface, and one whose practice revels in the possibilities of printmaking and multiples, it seems only natural that Kiki Smith has been working with Magnolia Editions since 2011 on a suite of thematically contiguous tapestry editions. Magnolia’s tapestry technique has proved to be an ideal vehicle for Smith’s visions, yielding objects halfway between printmaking and sculpture, rooted in the Medieval yet informed by digital sophistication, and possessing a complex yet beguilingly tactile surface. While her line and drawing style are unmistakable, Smith’s works in various sculptural and print media often employ sophisticated technologies in tandem with handwork. As Wendy Weitman writes in Kiki Smith: Prints, books & things, “Smith thrives on collaboration… Sculpture and printmaking share this collaborative attribute, each often requiring specialized artisans to achieve the finished object. Not surprisingly, Smith excels at both.” The artist is no stranger to textiles: she has been printing and painting on fabric since the early 1980s, including small editions of printed scarves. However, these tapestries employ no printing; their imagery is made up entirely of warp and weft threads. Each composition has undergone dozens of steps and versions on its way to completion, from large collaged paper drawings to digital files; prints to reprints to reprints with overpainting and more collaging; painting, weaving, and reweaving until each detail, texture, and color met exactly with the artist’s specifications.